Do you know what the name of the earring backing is on your earrings? Fish hook? Stud? Lever Back? 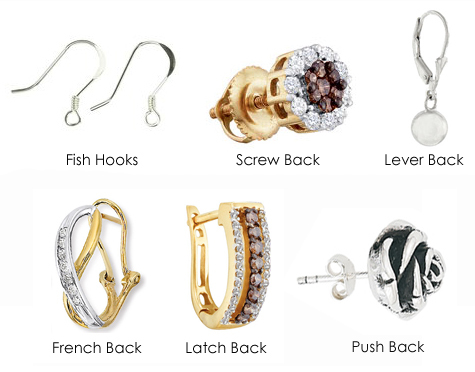 Below is a guide to help you know what those types of earring backs look like… also information about the many different styles of earrings that are available. Stud Earrings – are the most simple of all earrings. They can be diamonds, gemstones, pearls, gold or silver balls that are on a metal rod that stick through the ear lobe, with a small backing to secure them. These are usually the starter earrings that everyone gets when you first get your ears pierced. Simple and classic… They never go out of style! Hoop Earrings – are also a classic style that never seem to go out of fashion. They are a loop shape that goes through the ear lobe and hooks in the back. There are different types of hoop earrings, from diamond cut, metal hoops, hoops that are shaped, (hearts, stars, etc) … hoops with embedded diamonds or cz’s, hoops with dangling charms, simple gold hoops, etc. They can be hollow or solid, plain, or filled with gemstones or sparkling diamonds. Huggie Hoop earrings, loop through the ear and snap into itself on the other side of your ear lobe, so that you can’t see the backing. Latch back hoop earrings, have a wire that is hinged on one side and snaps into a latch on the opposite side. Drop Earrings – Lovely earrings, which dangle off the ear… these earrings usually hang off a fish hook, or they dangle down from a lever back. These can include chandelier type earrings, which have different lengths dangling down off the ear. They can include metal, silver, gold, and have gemstones dropping down. Types of Earring Backs for pierced ears – A list of the types of earring backings that help secure the earring on your ear. Some are stronger than others, and some have screw on backs, to prevent loss of your favorite and cherished jewelry. Fish Hook – Is curved like a hook, that goes through the ear. It’s long enough that it normally doesn’t have a backing. Screw Back – This is a more secure stud earring backing, as compared to the one that just slides on the post. The backing screws in on the post, and usually takes a little longer to put on your ears, but then you don’t have to worry about losing your earrings. Lever Back – The back is curved like a fish hook with an enclosure that latches behind the ear. Advantages of this type of earring backing is having it secure on your ear, so you won’t have a chance of losing it. French Back – It has a post that goes through a loop in the back, also sometimes called the “Omega” Backing. Latch Back – Is a hinged backing, usually on hoops that the post goes through. Push Back – The is the most common earring backing. It is also sometimes called a “butterfly” back because of it’s shape. It just slides on the post behind your ear lobe. This entry was posted in Jewelry, Jewelry Guides, Jewelry Tips and tagged about earrings, earrings, types of earrings. Bookmark the permalink.